Deschamps is confident that the future is bright for the team. RIO DE JANEIRO: France coach Didier Deschamps said that Germany's experience of the big occasion and his side's poor finishing proved crucial as the French bowed out of the World Cup on Friday. "There was not much between the sides," he said after the 1-0 quarter final defeat at the Maracana Stadium in Rio de Janeiro. "One team is more used to these occasions and has more experience. "We were not clinical in front of goal and Manuel Neuer made an important save at the end" from Karim Benzema. "We played much as we had done during the tournament but Germany are a better side than what we have faced so far. "We were a little timid at the start of the match but after that we did plenty of good things," said the coach, who dismissed suggestions that playing in the mid-afternoon heat and humidity of Rio could be blamed for France's exit. "The temperature did not help Germany any more than it did us. There was maybe a bit less freshness but everyone has to adapt." "A new group was created after our win in the play-off against Ukraine (in November) and I have seen some good things during this campaign. "We don't have the same experience at this level as Germany but I am proud of what the players have done on and off the field. "There is work to be done, but the materials are there and we need to maintain the same quality and the same spirit. "There is lots of sadness and frustration among the players but we can't forget what we have done well up to now. "I prefer to take away the positives that have been there since we arrived in Brazil. 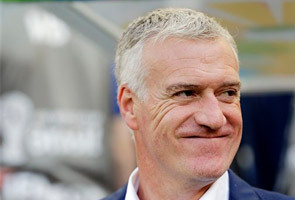 I am proud of everyone and am proud to have come this far with them," said Deschamps, whose thoughts will soon turn to the 2016 European Championship on home soil. Midfielder Yohan Cabaye echoed the thoughts of his coach, admitting the Germans' extra know-how helped see them through. "We were not far away from qualifying. They had a bit more experience on their side. We have to accept it, but it's tough," said Cabaye, adding the defeat was "cruel". Mathieu Valbuena, who has earned high praise for his performances in Brazil making light of the absence of Franck Ribery, said lack of accuracy in front of goal had cost them dearly. "We had a lot of chances but we did not put them away, we are just dead tonight," Valbuena told French television station beIN Sports. Benzema said that they had just cnme across a goalkeeper in fine form. "We can be proud of our campaign," said the Real Madrid striker. "We had a lot of chances in the match but the goalkeeper was on his game and was great." Let's Talk: Sporting Stars - How Much Does Cost? V!VA: SMOKING ELEPHANT, BIRTHDAY JACKPOT!